The 26.5 metre motor yacht Fortuna, listed for sale by Marc Haendle at Ocean Independence, has been sold in an in-house deal with the buyer introduced by Lukas Stratmann. Built in GRP by Italian yard Canados, Fortuna was delivered in 2008 and is RINA classed. Interior design is by Salvagni Architti who used solid wenge wood and neutral fabrics to decorate the accommodation for 10 guests in four cabins consisting of a master suite, VIP suite and two twins with Pullman berths. All guest cabins have entertainment centres, Sharp television screens and Travertine marble en suite bathroom facilities while a further two cabins sleep four crewmembers. The main saloon has ceilings in lacquered wood panelling and comfortable seating including a corner settee facing an entertainment centre featuring a 42-inch Pioneer plasma television screen mounted on a rise and fall mechanism and a Bose stereo surround sound system. Forward is a custom wooden dining table with seating for eight guests. The aft deck has built-in bench seating, five occasional chairs and a teak table for al fresco entertaining, while up on the flybridge is a C-shaped seating and dining area plus sunpads. More sunbathing is offered by the built-in sun pads on the private foredeck area sheltered by a Bimini top when required. 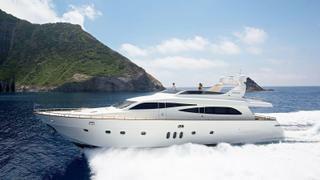 Twin 1,800hp Caterpillar diesel engines allow a cruising speed of 29 knots topping out at 33 knots.